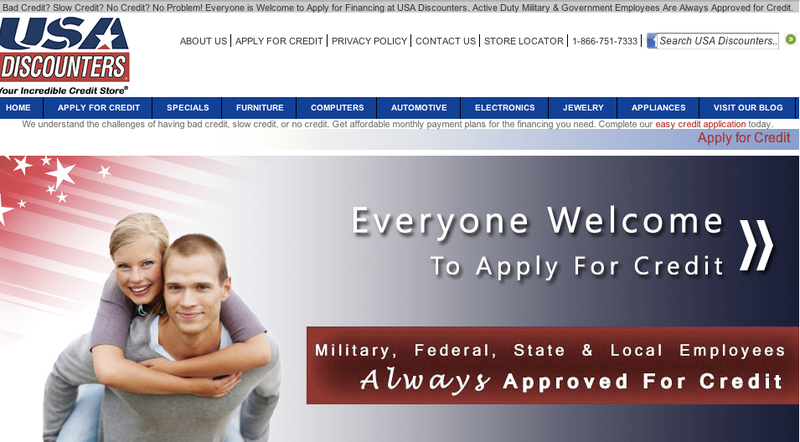 USA Discounters, which already came under scrutiny for its questionable lending practices, must pay $350,000 to servicemembers for an alleged fee scam. A discount retailer that came under fire last month for its questionable lending and marketing practices received a slap on the wrist from federal regulators for allegedly tricking thousands of servicemembers into paying fees for legal protections they already had and for certain services that the company failed to provide. The Consumer Financial Protection Bureau announced Thursday that USA Discounters, Ltd., which operates a chain of retail stores near 11 military bases, will provide $350,000 in refunds to servicemembers harmed by its fee scam and pay a $50,000 penalty for its actions. According to the CFPB, the Virginia-based retailer created a fee scam designed to exploit unsuspecting servicemenbers by charging for services disguised as legal benefits. Previously, the company made headlines for its high-cost financing plans in which servicemembers routinely paid more for items than they would have paid at other retailers. USA Discounters also has a history of suing customers who fall behind on finance payments for these overpriced items. The company, which sells furniture, electronics, bedding, and appliances, allegedly mischaracterized the protections provided by the Servicemembers Civil Relief Act (SCRA), which gives active duty servicemembers protections from debt collection in a number of scenarios. The CFPB charges that USA Discounters had servicemembers agree in a contract to pay a $5 fee for a company called SCRA Specialist LLC to be their representatives with respect to their rights under SCRA, should they be sued for a debt. USA Discounters portrayed SCRA Specialists Specialists as an independent business, when the company’s only source of revenue was from USA Discounters’ customers. The company gave nearly $4.50 of each $5 fee to SCRA Specialists, which has generated more than $350,000 since 2009. Additionally, USA Discounters sold SCRA’s services as a benefit to servicemembers, when in actuality, they only served as tool for the company to more easily sue the servicemembers. One function of SCRA Specialist was to verify the servicemember’s active military status so that the servicemember could receive certain protections; an aspect touted as a benefit for the consumer. However, USA Discounters used that information to report on the servicemember’s military status in order to obtain a default judgment against the servicemember. Under the order, USA Discounters must provide $350,000 in restitution to servicemembers for the $5 SCRA Specialist fee and a $50,000 penalty to the CFPB’s Civil Penalty Fund. Additionally, the company is required to no longer market contracts as a benefit to services members and can not pretend to that SCRA is an independent company. For consumers who repaid their installment accounts, USA Discounters will mail a check for the full $5 plus interest. For those consumers whose account is in collection, their debt will be discharged the $5 fee plus interest. Previous Did Apple Store Employee Use An Anti-Gay Slur Or Just Mash Fingers On A Keyboard?